The ICC Rules of Arbitration constitute one of the world's oldest and most widely used sets of rules for the resolution of international commercial disputes. 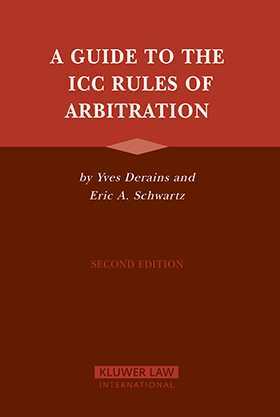 In 1998, shortly after the entry into force of the current version of the Rules, the First Edition of this book appeared and quickly became an indispensable resource for all those involved or interested in ICC arbitrations, including arbitrators, counsel, and parties. In this updated and revised edition, the authors two of the world's leading experts on ICC arbitration have revised the Guide in order to take stock not only of the evolution in ICC practice over the last seven years, but of new arbitral and judicial decisions bearing on the interpretation and application of the Rules and of developments in international arbitration practice generally. The Guide's notable features include:article-by-article commentary on the ICC Rules, enriched by the authors¿ personal involvement in their drafting and years of experience as arbitrators, counsel, and former Secretaries General of the ICC International Court of Arbitration;ample and greatly expanded references, in respect of the Rules¿ individual provisions, to relevant national court judgments and arbitral awards, together with extensive bibliographical sources; andup-to-date statistics on ICC arbitration and copies of all ICC rules on dispute resolution mechanisms in addition to arbitration.A truly comprehensive reference work on ICC arbitration practice, the Second Edition of the Guide will be of immeasurable value to corporate counsel, international lawyers, and business people, as well as to all those interested in the international arbitration process.